Materials for stamped parts have become increasingly sophisticated in recent years. Engineers are frequently choosing plastics as alternatives to traditional metal components like washers, gaskets, and spacers because of their high performance and low cost. Thermoplastic formulas such as Nylon and Teflon™ PTFE are especially popular and ubiquitous in a number of home and industrial applications. 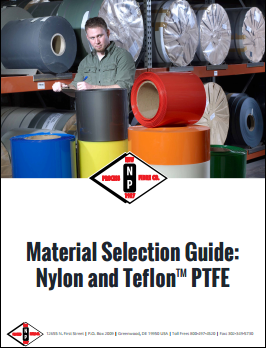 To download the Material Selection Guide: Nylon and Teflon™ PTFE, please complete the short form.